The field of developmental biology has introduced a vast array of genes, many of which have colorful, yet informative names that represent the physical appearance of flies affected by gene mutations. The names of such genes span from pop culture references, like Ken and Barbie, to food items found at the grocery store, like Swiss cheese. Some of these odd gene names have become problematic as scientists are discovering similar gene variants linked to developmental abnormalities in humans . Ken and Barbie normally encodes a protein that functions in genitalia development. Mutants of this gene lack external genitalia, similar to the Ken and Barbie dolls in toy stores . Sonic hedgehog is important in body segmentation. Sonic hedgehog mutants develop a spiky phenotype, like the well-known video game character and animal . 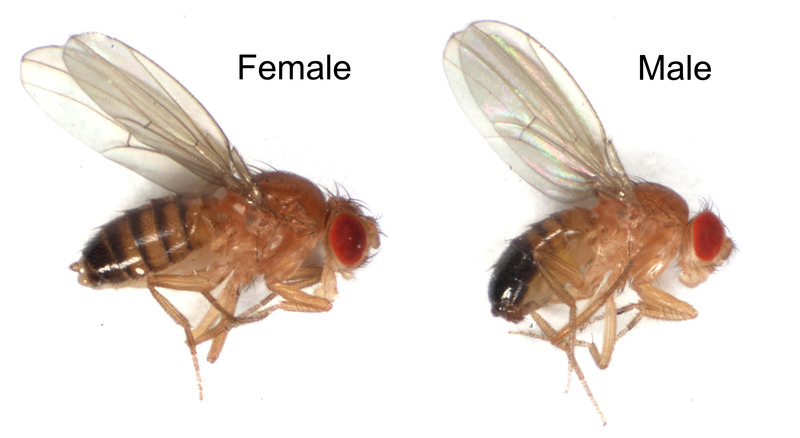 As research continues on these fruit fly genes, some have been identified in humans and associated with serious genetic disorders. 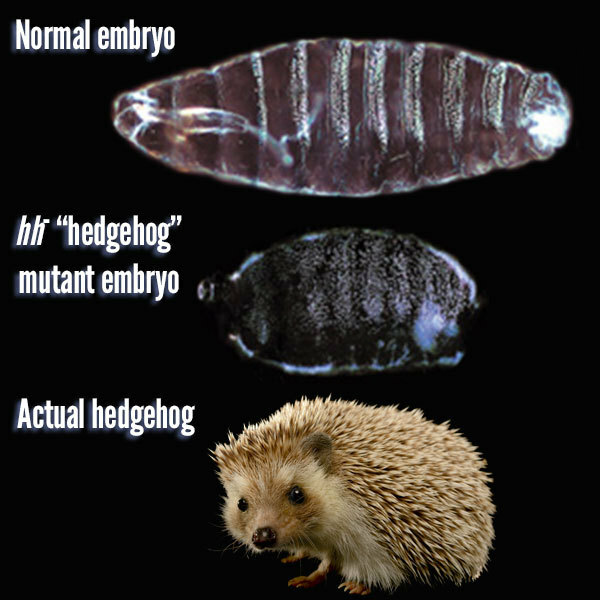 Hedgehog, the human form of the Sonic hedgehog gene, has been linked to a human developmental disorder that results in severe brain, skull, and facial defects . The creative names of fruit fly genes are becoming problematic as the role of some of these genes are being translated to medical disorders in humans. Mark Ludman, a medical geneticist at a Canadian university, put the gene name problem in context: “…if I were talking to a patient and telling them the problem is that they have a mutation in their Lunatic fringe, that would be an inappropriate conversation we were having,” he says . In 2006, the Human Genome Organization Gene Nomenclature Committee stepped in and changed some of these names, including both Lunatic fringe and Sonic hedgehog. When asked what the Lunatic fringe gene would now be called, Dr. Elspeth Bruford, then-chairwoman of the committee, proposed to “rename [the genes] on a functional – if somewhat prosaic – basis, e.g. LFNG O-fucosylpeptide 3-beta-N-acetylglucosaminyltransferase .” While the nomenclature of genes that are linked to human disorders should be appropriately informative, renaming these genes in terms of abbreviations, numbers and/or biological enzymes that are difficult for patients to understand may not be the best solution. Perhaps, the committee will revisit the nomenclature of these genes in the future, with accessible language in mind, if more are found to be associated with human developmental disorders. Lukacsovich T, Yuge K, Awano W, Asztalos Z, Kondo S, Juni N, et al. The ken and barbie gene encoding a putative transcription factor with a BTB domain and three zinc finger motifs functions in terminalia development ofDrosophila. Archives of Insect Biochemistry and Physiology. 2003;54(2):77–94. Kretzschmar D, Hasan G, Sharma S, Heisenberg M, Benzer S. The swiss cheese mutant causes glial hyperwrapping and brain degeneration in Drosophila. Journal of Neuroscience. 1997Oct1; 17(19):7425-32. Bodmer R. The gene tinman is required for specification of the heart and visceral muscles in Drosophila. Development. 1993Jul;118(3):719–29. Nüsslein-Volhard C, Wieschaus E. Mutations affecting segment number and polarity in Drosophila. Nature. 1980;287(5785):795–801. prof premraj pushpakaran writes -- 2018 marks the 100th birth year of Edward Butts Lewis!! !